Are you planning a Bachelorette Party now or sometime this year? Do you have so many ideas (or maybe none at all) floating through your head that it’s hard to know where to start? Look no further….here are 5 tips for a brilliantly successful Bachelorette bash! DO focus on the Bride. Does the bride want a WILD night, or is she wanting a Pedicure and Champagne evening? Does the bride want to travel somewhere for a getaway, or would she rather stay close to home? Ask yourself these questions…….or ask the Bride herself if you’re unsure. This is the first critical step to planning an unforgettable and fabulous Girls Night Out! DON’T just invite the friends and family you think the bride wants there (or who are in your inner circle). Your inner circles might overlap, but there may be friends and family who are important for her to have present that don’t cross over. DO make sure you get the guest list and send the invitations out in a timely manner……early enough so everyone can make plans (especially if traveling), but not so early that people forget about the party. DON’T go overboard on the decorations…..at least not until you have a Theme or Color Palette picked out. DO pick a party theme or color scheme, then check out our decorations to throw an unforgettable bash. DON’T forget to accessorize the bride-to-be. DO think back to the first tip and focus on the bride. If the bachelorette wants a Wild night on the town, you can find fun and naughty tiaras, tattoos, and attire to make her really stand out in the crowd. If she wants a quiet evening with friends, you can still make her feel special with our selection of nice tiaras, sashes, and glittery accessories. DON’T over or under-estimate the importance of a good tablescape. DO plan out your tablescape, including the food and drink menu. You don’t need to stuff every guest full (especially if you’re going out later), but you do need to make sure there’s a good ratio of food to drinks so everyone has a good – and safe – night. Whether you’re going Wild or keeping it Tame, we have the Plates, Napkins, Drinkware, Bakeware, and miscellaneous things you will need for a bountiful tablescape. So, if you’re planning a bachelorette party anytime soon, remember these 5 tips and you’ll be off to a great start towards a fabulous and memorable night! Stay tuned for more great tips, including party favors, gifts, and party games. 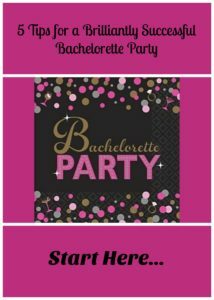 This entry was posted in Bachelorette Cocktail Supplies, Bachelorette Decorations, Bachelorette Party, Bachelorette Party Accessories, Bachelorette Party Invitations, Bachelorette Party Planning, Bachelorette Party Supplies, Bachelorette Party Themes, invitations, New & Exciting, Party Planning on February 20, 2017 by Tiffany Freitag.